I read enough reviews about this movie that I couldn’t get past the intrigue… Take a bunch of aging actors and/or old action stars (Stallone, Willis, Schwarzenegger, Lundgren, Li, Austin, Rourke, Roberts) and make a drama movie! Well, of course not. Make an action movie! With my son and his best friend in tow, we ventured into the Saturday night testosterone zone. At the end of movie, we were shaking our heads about the time we wasted. This was the type of 2:00 a.m. summer movie they stream from Netflix and laugh at for all the wrong reasons. The only problem is, they forgot the humor. With so much potential for star-studded deprecating low blows and cheap shots, there was only one line in the movie that made me laugh. This was rather early in the movie and related to a cameo scene with Arnold Schwarzenegger. After that? Stallone pursues the action as if it was 30 years ago, and as if he was 30 years younger, and as if this was, ahem, a serious action movie. Body sculpting aside, no. Let it go. This could have been a thunderous answer to the overrated and thoroughly grating Tropic Thunder. 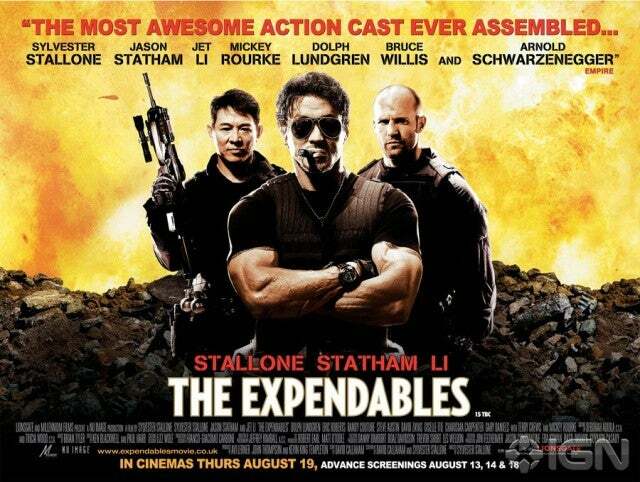 I mean, The Expendables. It’s the perfect title for a different movie. Other than its genre and aging workforce, the more conspicuous nod to the 1980’s was a refrain from reality-bending special effects. There are ample explosions that go “boom!” and bullets that go “zing” and necks that go “crick,” but other than gore inducing bullet hits, computer generated graphics aren’t a notable factor in the movie. And how refreshing is that?!. Sadly, when Bruce Willis continues to make the best “shoot ‘em up” action movies (see Live Free or Die Hard), it’s sad that a new generation of B to A- actors isn’t out there mining the familiar excesses of the genre. There’s obviously a market for it. Besides, my son needs his own remembrances of action movies when he relives his childhood – not mine. And that is to name a few. What modern day heroes do we have today? Jack Sparrow (Depp)? Even Tom Cruise who did Valkyrie (2008) is only 4 years younger than I.
I think we have removed the heroes from today and replaced them with quasi-androgenous beings like sponges or Hispanic explorers. It just kills the imagination IMO.